Dreams Punta Cana Resort & Spa is a secluded, family-friendly, all-inclusive resort, located about 30 minutes north of Bavaro, Punta Cana on a pristine stretch of spectacular beach. This Unlimited-Luxury® resort is undiscovered treasure, offering an ideal vacation escape for active couples and families with children. Dreams Punta Cana Resort & Spa boasts a magnificent freeform swimming pool that winds from the lobby down to the beach and includes waterfalls and a swim-up bar. A wide choice of a la carte restaurants, chic bars and live shows complement the vast array of activities including an ocean trampoline, an expansive spa and fitness center plus an on-site casino. With so much to choose from, Dreams Punta Cana is the perfect escape from everyday routine. 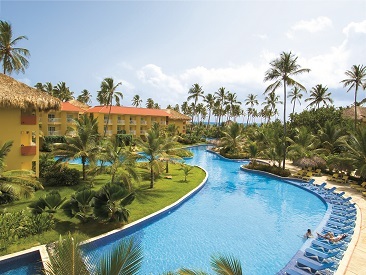 Dreams Punta Cana Resort & Spa is a secluded family-friendly resort located about 30 minutes north of the Bavaro area on a pristine stetch of spectacular beach. This Unlimited-Luxury® resort is undiscovered treasure offering an ideal vacation escape for active couples and couples with children. Dreams Punta Cana Resort & Spa boasts a magnificent freeform swimming pool (one of the largest pools in the Dominican Republic) that winds from the lobby down to the beach with waterfalls and a swim-up bar. A wide choice of a la carte restaurants, chic bars and live shows complement the vast array of family-friendly activities including an ocean trampoline, an expansive Spa and fitness center and an on-site casino. Plus, the Explorer's Club for Kids, children's play areas on the beach and activities specially geared to the teen crowd will provide lasting memories. A romantic place for weddings and honeymooners as well, Dreams Punta Cana Resort & Spa features a romantic wedding gazebo, 24 hour room service, intimate suites and a luxurious Preferred Club level. 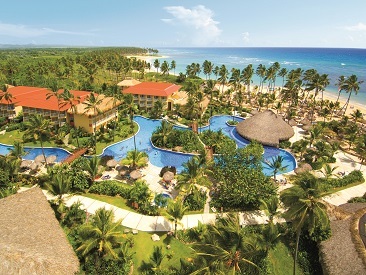 Dreams Punta Cana Resort and Spa is now Rainforest Alliance Verified! As part of the privileges of Unlimited-Luxury®, we’re offering guests of Dreams Punta Cana Resort & Spa the chance to Sip, Savor & See Dreams Palm Beach Punta Cana, Dreams La Romana Resort & Spa, Dreams Dominicus La Romana, Now Larimar Punta Cana, Now Garden Punta Cana, Now Onyx, Sunscape Dominican Beach and Sunscape Bavaro Beach. Enjoy dinner and live entertainment at neighboring resorts including sipping complimentary cocktails, savoring delicious cuisine at the restaurant of your choice and the opportunity to see that evening’s entertainment. 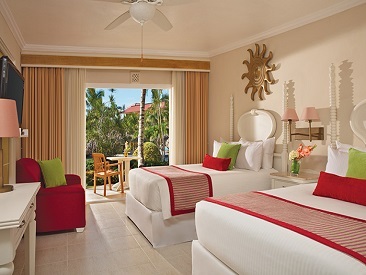 Dreams Punta Cana Resort and Spa also offers a romantic setting for couples looking to relax and find solitude. Three wedding packages are available; plus, a complimentary honeymoon and anniversary package is available as well. Click on the WEDDINGS tab for full details.